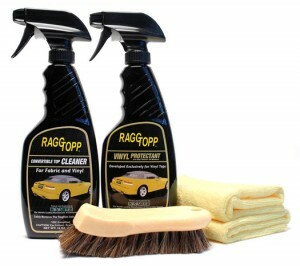 Convertible top care made easy!A good convertible top cleaner and protectant will prolong the beauty and function of your convertible top. Whether it’s a fabric convertible top or vinyl top, it will benefit from regular maintenance. You’ll find that having a convertible is just as carefree and fun – even more so – when you have a clean, well-protected top. You can achieve proper top care in just a few easy steps. Regular cleaning of your vinyl top is as easy as washing your car. Use a gentle car shampoo, like Pinnacle Bodywork Shampoo, and we recommend the Green Long-Handle Tire & Wheel Brush with its feathered bristles to free the dirt from the textured vinyl of your convertible top. Wash the top just as you would the rest of the vehicle. Avoid shampoos that improve gloss. They are good for the paint, but unnecessary for the top. Fabric top maintenance is essentially the same as vinyl top maintenance, except you want to select products formulated for fabric. Convertible top cleaners are usually suitable for either vinyl or fabric. Use a moderately stiff brush, like our Green Long-Handle Tire & Wheel Brush to loosen dirt from the fibers. It’s a marvel of modern science that fabric tops repel water as well as they do, but all good things must come to an end. Fabric tops are chemically treated during manufacturing to repel water and contamination, but these chemicals diminish as time passes. Exactly how long the factory repellant will last is dependent on usage and the environment, so it’s best to keep an eye on your top. Your regular washings should reveal a gradual reduction of water repellence. You’ll want to watch carefully for signs of water puddles or wet spots where water has clearly penetrated the fabric, its time to treat your top. The windows on convertible tops often age faster than the rest of the top. Clear vinyl is notorious for yellowing, cracking, and scratching. There is a solution, though. Treat the windows with Diamondite Plasti-Care. This is a cleaner and protectant that prevents cracking and maintains clarity. Applying Plasti-Care from the day you buy your convertible is a great way to keep those convertible top windows clean and clear.